The Tokugawa Shogunate, the Japanese government during the Edo period (1603-1868), closed the country to foreign commerce, except for the Netherlands and China. However, in 1854, Japan signed a friendship treaty with the United States, the United Kingdom, and Russia one after another. Hakodate became a port town open to foreign commerce. In 1858, Japan signed a trade treaty, and Hakodate became a trade port the following year. The Tokugawa Shogunate dispatched high-ranking officials, called Hakodate magistrates, to Hakodate to be in charge of negotiations with foreign countries, defense of the shores, and the administration of the city in Hakodate. The government planned on building a government office for Hakodate magistrates inland protected by a fort away from the port and downtown area. They ordered the professor of European studies and techniques, namely Ayasaburo Takeda, to design the fort. 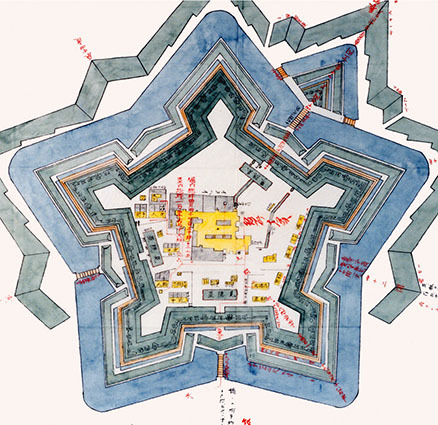 He studied the fortified cities of Europe in the early modern period to design a fort that could protect against battles using guns and cannons. It took nearly seven years for the construction. 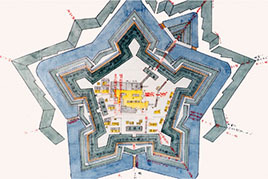 The star-shaped fort was nearly completed in 1864. The fort was named Goryokaku. Goryokaku was built as a center for politics, foreign diplomacy, and defense in northern Japan. 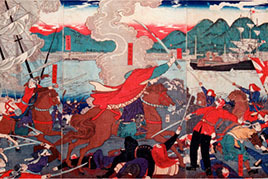 This block print depicts the Battle of Hakodate. 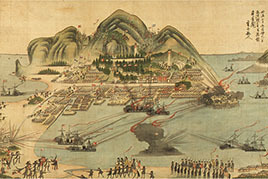 This drawing depicts the battle of battleships at Hakodate Port. While the Tokugawa Shogunate lasted more than 260 years, it started to lose power gradually. The opposing forces of the Tokugawa Shogunate tried to defeat them by joining hands. In 1867, although Tokugawa overthrew the reins of government, the Boshin War broke out in Kyoto the next year. This battle spread to various parts of the country. Tokugawa and their allies lost the battle with the opposing forces in series. Takeaki Enomoto, who was the vice admiral of the Tokugawa navy, came to Hakodate on a warship carrying nearly 3,000 soldiers of the Tokugawa military and allied forces. They set up their headquarters at Goryokaku in an attempt to pioneer the northern land of Japan (Hokkaido) and sought permission from the Meiji government, which was Japan’s new administration. However, in 1869, the Meiji government dispatched a large army to Hakodate to attach the Tokugawa military. This battle is called the Battle of Hakodate. In the battle, Toshizo Hijikata, who continued to fight from the first battle in 1868, and many other people lost their lives in the final defeat of the Tokugawa military. In this way, the last civil war of Japan ended, and a new era began in Japan. Goryokaku was built by the Tokugawa shogunate and became the last place that brought an end to Japan’s feudal system. Even so, the government opened Goryokaku to the public as a park for citizens in 1914, which became a space of relaxation. In 1952, Goryokaku was designated Japan’s special historic site to serve as a historic site in the era when the administration changed from the Tokugawa shogunate to the Meiji government. He is a scholar who studied European studies. Takeda conducted research on iron making, shipbuilding, production of cannon, fort building, and military techniques. Takeda was also an excellent educator who taught European studies to young people. He was a chief retainer of the Tokugawa Shogunate. He studied abroad in the Netherlands and learned law, shipbuilding technology, and military engineering. Although he was the vice admiral of the Tokugawa navy, he occupied Goryokaku and fought against the new government forces as a leader of the Tokugawa Shogunate and the allies. He came from a wealthy family and studied swordplay. He became the vice commander of the Shinsengumi, which was one of the Tokugawa Shogunate’s police organizations. He was stationed in Kyoto to control the anti-Tokugawa forces. He led the battle as the vice commander of the Tokugawa army at Goryokaku. 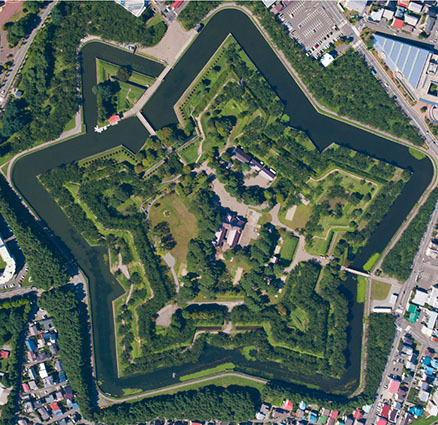 Star-shaped castles were invented around the 16th century in Europe. Many fortified cities, where the entire city is surrounded by castle walls, were built. When guns and cannons were developed, the structure of castles also improved. In this way, star-shaped castles were born. European countries built such castles around the world when expanding into other countries. Goryokaku of Hakodate was built by the Japanese who studied techniques from Europe. March:Tokugawa Shogunate signs a friendship treaty with the United States. April:An American fleet visits Hakodate to survey the port. June:Tokugawa Shogunate sets up the Hakodate Magistrate's Office in Hakodate. March:Tokugawa Shogunate opens the Hakodate Port for friendship and exchange. August:A school is established in Hakodate to research European studies. June:Goryokaku is almost completed, and the Hakodate Magistrate's Office moves inside Goryokaku. October:The Tokugawa Shogunate overthrows the reins of government. January:A battle of the Tokugawa Shogunate military and conflicting forces occurs in Kyoto. October:The Tokugawa Shogunate military enters Goryokaku. December:The Tokugawa Shogunate military establishes a temporary regime. April:The new government forces began attacking the Tokugawa Shogunate military at Goryokaku. May:The new government forces launched a full-scale attack on the Tokugawa Shogunate military. The war ended. February:Natural ice cutting begins at the moat of Goryokaku. June:Goryokaku becomes a park for citizens. March:Goryokaku is designated as a special historic site. Photos are housed at the Hakodate Central Library and the Hakodate City Museum.